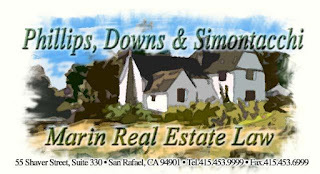 Steve Simontacchi of Phillips, Downs and Simontacchi, LLP is our go to real estate attorney. I have known Steve since High School and refer him to all of our clients. Steve has been practicing law since 1988 and the partnership of Phillips, Downs and Simontacchi, LLP was established in 2004. Steve handles all things real estate including transactional work and litigation. Unlike large law firms, Steve is easy to reach and has always been quite accommodating for us. It is best to reach Steve by phone or e-mail; 415.453.9999 / steve@MarinRELaw.com. So if you have a dispute involving real estate or need guidance in re-introducing a tenant back to the market place, give Steve a call. We do.